The mystery of Berryman B. Wood has become less mysterious thanks to a discovery by his descendant Tessa Rasnick. One of the big mysteries has been when did Berryman B. Wood die? When he died no marker was set. Perhaps they couldn’t afford one. They buried him by his wife, Sarah Catherine Lucas Wood, and she had a stone. Perhaps they meant to add his name. Whatever, it never happened. At some point Wilford Ryan, a grandson, poured a concrete stone and, using a stick, wrote his name and date of death. Various cemetery walkers have said the now worn stone said 1911 and 1914. No death certificate has ever been found. They weren’t mandatory in Illinois until 1916. Tessa was hunting for obits in old newspapers when she looked up John Allen Wood, a son of Berryman. John Allen is her third great uncle. This is what she found in The Decatur Herald for May 20, 1909. “Son of the late Berryman Wood.” (emphasis added) That pretty much eliminates 1911 and 1914 as death dates. It also explains why he cannot be found in the 1910 census. We still don’t know for sure exactly when he died but the 1908 date looks a lot more likely. How many generations in your direct female line do you know? This question is for females. The way records were kept men can generally go further back with data on male lines than females with their female lines. Mitochondrial DNA is inherited solely from the mother and thus enables the trace of your maternal line back in time. Unfortunately it can’t put a name to the members of the line. Obviously you are #1 and your mother is #2. My maternal grandmother #3 was Leona Ethel Ryan Downing who was born in 1892 and died in 1975. Her mother was Lillie Margaret Wood Ryan #4. Lillie was born in 1871 and died in 1956. I knew all of these people. Lillie’s mother, #5, was Sarah Katherine Lucas Wood. Sarah was born in 1835 and died in 1896. Sarah’s mother was Mary Turner Lucas #6. She was born in 1813 and died in 1855. Lillie, Sarah and Mary are buried in the same area of Lake Bank Cemetery, Lake Fork Township, Logan County, Illinois. Mary’s mother was Margaret Low Turner. Margaret #7 was born in Maryland around 1793, had 13 children and died, presumably, in DeWitt County, Illinois, after 1870. Her husband Allen had died in DeWitt in April 1846. Margaret’s mother was Mary Low, maiden name unknown. We know her name was Mary from land records in Ohio. Mary #8 was born about 1771 in Maryland, married Nathan Low and died after 1827, presumably in Madison now Clark County, Ohio, where her husband died a few years later. I came across a genealogy involving one of my ancestors. There was a dispute over his name. I could offer my argument for the name IF I could offer proof. Of course, there is no birth or death certificate and this case there is no marriage certificate due to a courthouse fire. I know where the body is buried but there is no readable stone. I have several pictures of him which prove nothing. My grandmother, for reasons unknown, always referred to her grandfather as Berryman B. Wood. Something about that amused her but I never thought to ask. I have no doubt as to his name. And there was certainly no provision to add the following. Berryman Baughan and Solomon Wood were close friends. They married sisters. Solomon Wood married Phebe Lucas and Berryman Baughn married her baby sister Jane Lucas. The story is they each agreed to name a child after the other. When they made this arrangement is unknown. 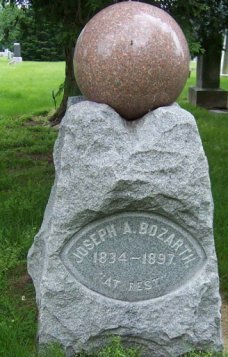 Both married in Greene County, Ohio, and then came to Logan County, Illinois, settling in Corwin Township. In researching families we frequently see sons named after grandfathers with the third son named after the father. Berryman and Jane had six children, four of whom were girls. The boys were Abraham and Hiram, probably the grandfathers – we know Abraham was Jane’s father. Then Jane died. Berryman remarried and had four children, three girls and one son, Solomon Wood Baughan. His second wife died. He remarried again and seven children, two of whom were boys. He promptly named the first son Berryman but the child died. The second son was also named Berryman. In the end Berryman Baughan had 17 children, only five of whom were boys. But one was named after his friend Solomon Wood. Solomon and and Phebe had eight children before Phebe died. Only two were boys. The first was Joel, which was Solomon’s father’s name, and the second was Berryman Baughan Wood. After Phebe’s death Solomon, who was the second coroner of Logan County, married Rhoda Turman. They had one son, Solomon S. Wood, before Solomon died. How can there be doubt as to the name of Berryman Baughan Wood? This is about Berryman Baughan Wood. Berryman B. is not related to Lida although all but three of her grandchildren are his great grandchildren. Berryman was the son of Solomon and Phebe Lucas Wood. His parents came from Greene County, Ohio, with the migration of church members who formed the Lake Fork Predestinarian Baptist Church in Logan County, Illinois. Phebe’s parents, Abraham and Marcy Kelsey Lucas, and living siblings also made the move. The couple bought land and settled at Rocky Ford in Corwin Township, about 15 miles from the rest of the family. Berryman was born there on December 22, 1834. What happened next is a mystery due to the 1856 courthouse fire. We know that Solomon Wood was the second coroner of Logan County. We know Phebe died after 1839 when her last child was born, probably before Solomon sold his land on what is now Lucas Chapel Cemetery and moved in 1842. [Land records survive.] It assumed that Phebe is buried in Lucas Chapel but time and the regular spring flooding of Salt Creek have erased all traces of burials in that section of the cemetery. Solomon remarried by 1847 and his last child was born February 23, 1848. Less than two months later Solomon was dead. Rhoda Tuman Winn Hoffman Wood, the widow, was Administrator of the estate [notice published in Springfield paper]. On April 23, 1849, the widow deeded all interest in Solomon Wood’s land to his heirs and they in turn deeded all interest in her premarital property to her. John Lucas signed as guardian of Joel, Berryman, Lucinda, Rebecca and Solomon. By 1858 the record indicates Ezekiel Bowman was guardian of the two remaining minor children, Solomon and Rebecca, and executor of the Wood estate. On December 22, 1855, Berryman married Sarah Katherine Lucas. Berryman was a grandson of Abraham Lucas. Sarah was a great granddaughter of Abraham Lucas. Her grandparents were Hannah Bowman and James Lucas. 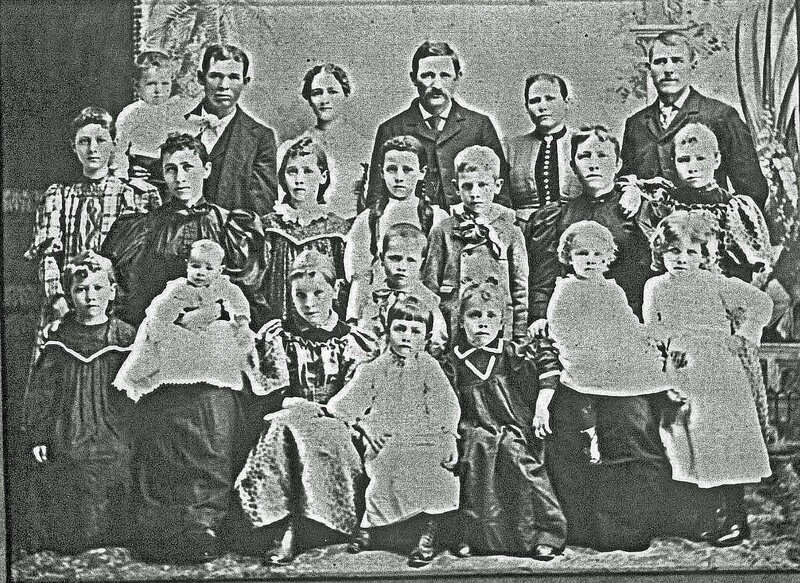 Berryman and Sarah produced 13 children while bouncing around the country. They went to Missouri but returned to Logan County. They went to Texas and returned to Logan County. They went to Kansas and returned to Logan County. On January 20, 1896, Sarah died. The above picture is of children and grandchildren of Berryman B. and Sarah Katherine. We suspect it was taken when they gathered after Sarah’s death. They placed a stone for her. The rest of Berryman’s life is also a mystery. My grandmother remembered him with love and amusement. No children or grandchildren survive and almost all of the great grandchildren have died. No record of Berryman’s death has been located. We know it was 1911-1915, probably 1912-1914. When he died no one put up a stone. Years later a grandson made a marker out of concrete and put it on the grave. The death year is unreadable.